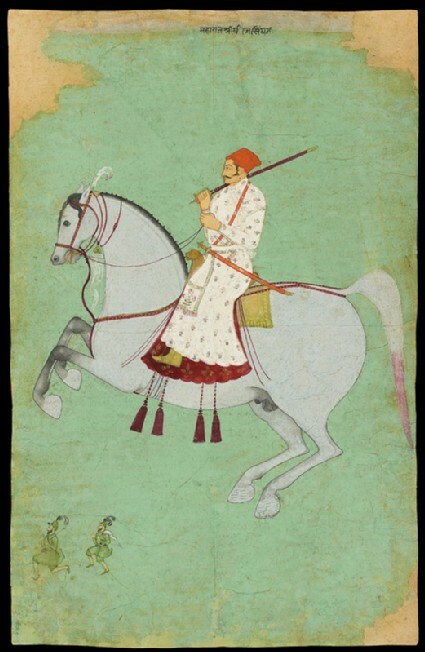 In this variation on the equestrian portrait convention, Dhiraj Singh of Raghugarh (r.1697-1726) sits astride his rearing horse as if in a sea of pale green. Below the tiny groom and fan-bearer trot gamely alongside. Dhiraj Singh was a successful warrior and a Rajput chief of sufficient standing to marry the daughters of the Udaipur and Jaipur rulers.